The Whirlwind Tours section shows you how to see the entire city in a day or a weekend; what sites will interest kids most; plus, a hedonist’s tour that’s pure pleasure from dawn to midnight and beyond. The Neighborhoods section of the book presents the city broken down into eight itineraries that lead you on a step-by-step tour to the best sites in each of the city’s greatest neighborhoods–from Ciutat Vella and Barceloneta to Barri Gotic and the Rambla to the Eixample and Uptown and beyond. Each itinerary includes such special features as “Distinctly Barcelona…,” highlighting quintessential aspects of the city (coffee & cava, the Catalan culture, and soccer); “Best Of,” providing specific thematic groupings of sights, such as city views, sporty Barcelona, and Barcelona-style nightlife; and “in-depth” spreads that take a deep dive into a major museum or other iconic sight along the route.Travel Essentials provides information on how to get to the city and how to get around once you’re there, as well as hand-picked hotels and restaurants. 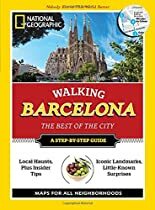 Walking Barcelona is part of an exciting pocket-guide series from National Geographic that showcases the world’s great cities. Travelers will find top-notch, streamlined, and useful local knowledge that goes beyond the Internet basics to ensure a rewarding, authentic, and memorable urban experience.